Released as a digipak. Some copies include a signature Infernus pick. The back cover lists 6 songs but there is a 13 sec. 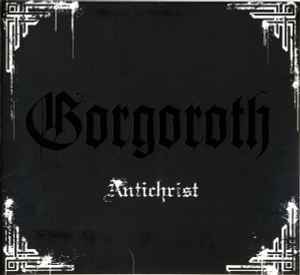 interlude between 'Gorgoroth' and 'Possessed (By Satan)' (a short sound of wind) that appears as the 4th track in any CD-player. Hat and Pest are simply credited for vocals (no track spec.). They're correctly credited for separate tracks in the credits section here. The enhanced CD-ROM material includes two folders called "CDPLUS" and "PICTURES" - the "CDPLUS" folder contains two files called "Info.cdp" and "Sub_info.us" and the "PICTURES" folder contains five Gorgoroth desktop images in three different sizes each (.jpg format) a front cover .jpg file and 36 other files in different formats. ©&℗ MMV Season of Mist.